“Past Forward” Opening Night & Update! We just wanted to update you guys on the Bassano show, “Past Forward” that began on the 31st of August. 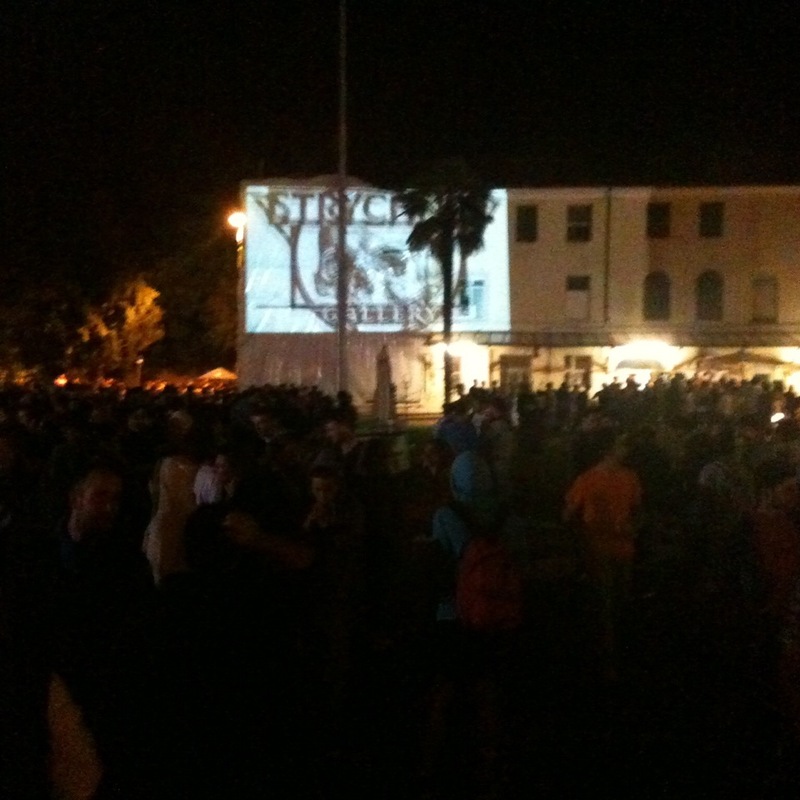 This is an image of how it looked outside the venue on opening night. Coincidentally, we had a cheerful visit today by one of the participating artists, Sandra Hauser, who wanted to visit Strychnin Gallery while in Berlin. For the Bassano show, Sandra was inspired by Carravaggio’s stilistic and characteristic tenebroso painting; a dramatized usage of the chiaroscuro. She created a hipnotic double portrait that bears the name “Devi morire prima di morire” (“One must die, before he can die.”) Another example of the works inspired by Renaissance and Baroque artists, was the installation created by Ufocinque. A magnificently light up paper-cut installation. His work is that of a steady and disciplined hand. He works in lawyers of paper cuts, to create a 3D enviroment within a frame, triggering an ethernal and dream-like state for the viewers. His work was inspired by “Amor & Psyche” and “The Three Graces”, both by Antonio Canova. Tomorrow is the last day to visit the exhibition, so if you’re around, don’t dare and miss out! This entry was posted on October 5, 2012 by strychnin in Uncategorized and tagged Giovanni Cervi, Musei Civi Bassano del Grappa, Sandra Hauser, Strychnin Gallery, Ufocinque, Yasha Young.